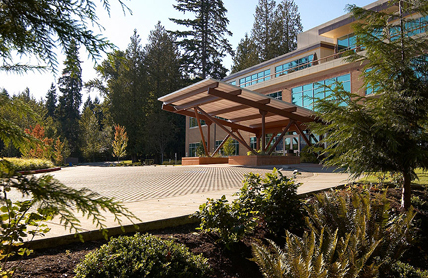 Built into a south facing hillside at Lacey Corporate Center, the Twin Star Corporate Headquarters Building enjoys views of Mt Rainier, particularly from dramatic rooftop decks. 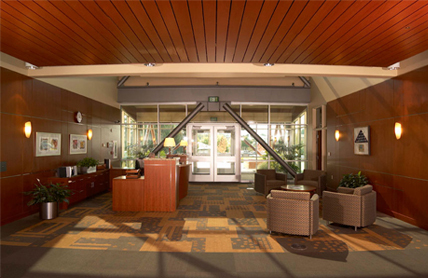 The hillside provided major building entries at different levels as the owner desired. 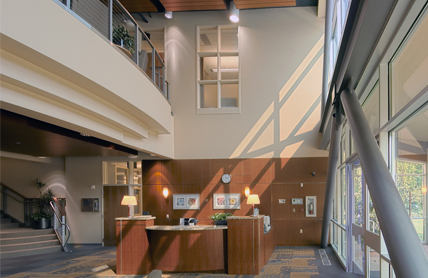 Though constructed before LEED certification, the building includes a displacement air mechanical system which maximizes individual control; open floor plates maximize north-south exposure for daylight and views; and all on-site paving and parking areas are constructed of pervious brick pavers, reducing the heat island effect and eliminating the need for any storm-water collection, retention or filtration systems.